Jefferson Regional Foundation seeks to promote the health and vitality of the communities we serve by listening, gathering and sharing information about local resources, data and emerging needs. Over the coming months, we will be releasing a series of Priority Briefs focused on each of the Foundation’s strategic priorities: Increasing Health Access and Prevention, Improving Child and Family Outcomes, and Strengthening Vulnerable Populations and Communities. Each priority brief will outline the issue and its current landscape, key providers, the Foundation’s early grants and activities in this priority area, and future opportunities. Our intention is to share important community information which will also guide Foundation grantmaking in our priority areas. We welcome your comments or suggestions at foundation.info@jeffersonregional.com. 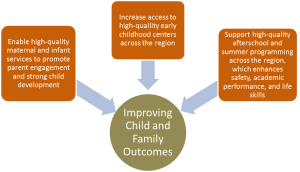 The first Priority Brief is focused on the Foundation’s Improving Child and Family Outcomes priority and can be found here.